Over the weekend, Kristy and I were camping at Four Mile Creek State Park just outside of Youngstown, New York. Youngstown is a tiny little town overlooking Niagara River and Lake Ontario. In the morning, we’d stop by Ashker’s Coffee House. Ashker’s is a very cool place, presumably named after the proprietor, who also serves as the principal chef. His display case held several delicious muffins (On Friday, I tried the awesome chocolate chip muffin). 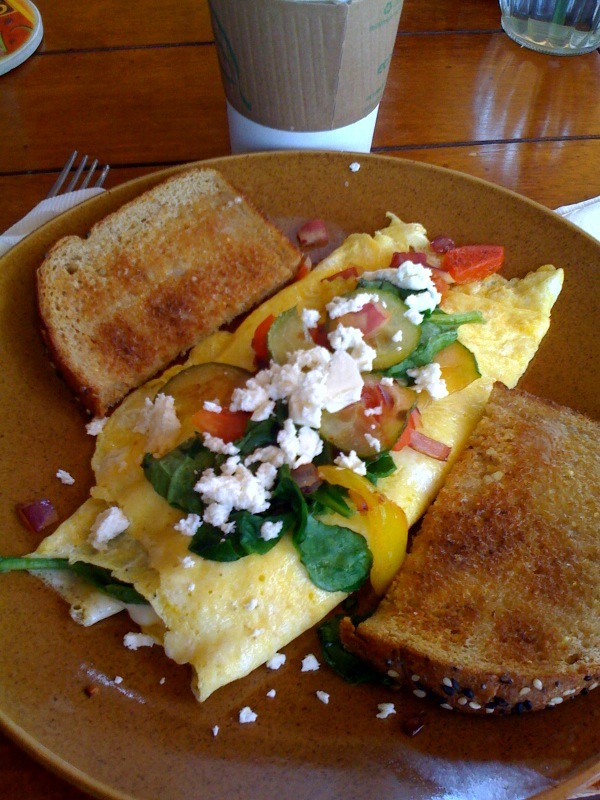 Ashker’s offers breakfast and lunch food in addition to standard coffee drinks. On Saturday, I tried the vegetarian omelet. The vegetarian omelet was cheap and scrumptious. Fillings included spinach, zucchini, feta cheese, red pepper, red onion, and mild pepper. I was somewhat nervous about the mild pepper, so I picked it out. Mild yellow peppers (the kind you buy canned) typically have food coloring additives to keep them glowing a bright yellow. Just a risk I didn’t want to take. Ashker’s receives absolutely no complaints about me. A very friendly, quiet establishment with ample street parking and wifi. If you’re ever near Youngstown and looking for coffee, stop by Ashker’s.